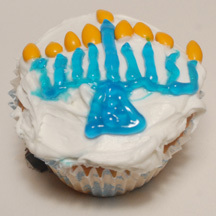 Celebrate Hanuakkah with this very easy menorah cupcake. By using gel icing in a tube, you can avoid the trouble and mess of pastry bags. What You Need: 1 cupcake; white frosting; blue gel icing in a tube; chocolate covered sunflower seeds (yellow). This entry was posted on Sunday, December 7th, 2008 at 12:36 pm	and is filed under Hanukkah cupcakes. You can follow any responses to this entry through the RSS 2.0 feed. Responses are currently closed, but you can trackback from your own site.